The spiral shaped bacterium Helicobacter pyloriis strongly associated with inflammation of the stomach and is also implicated in the development of gastric malignancy. H. pylori is known to cause peptic ulcers and chronic gastritis in humans. It is associated with duodenal ulcers and may be involved in development of adenocarcinoma and low-grade lymphoma of mucosa associated lymphoid tissue in the stomach. 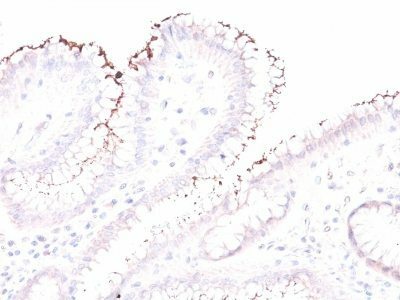 This antibody stains the individual H. pylori bacterium when it presents on the surface of the epithelium or in the cytoplasm of the epithelial cells in biopsy tissue sections from the antrum and body of the stomach. Catalog number key for antibody number 0374, Anti-Helicobacter pylori (PAb) The prefix indicates conjugation, followed by the antibody number and size suffix.